• What is our volume? • How many people will use the machine? • What size books (thickness and sheet size) will we be making? Will this change in the foreseeable future? • How important is the final look / presentation? • What is our budget now, and moving forward for consumables? 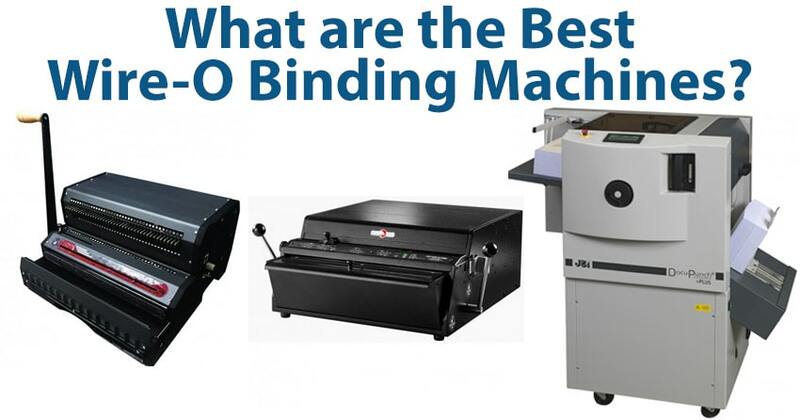 So with those questions in mind, your individual needs may vary a bit from the specific machines we discuss below...but in general, the brand names that we discuss are high-value across the board, so you really can't go wrong sticking with these top wire binding machine brands. Akiles is almost always my go-to for a binding machine of any kind. Their WireMac line of wire binding equipment is no different. They offer incredibly value and keep the overall price of the machine quite low considering all of the features, functionality, and how each their equipment is to use. Although Akiles manufactures overseas, their office is US-based, and we have a solid relationship with them, which has led to careful one-on-one care whenever we encounter any problems (which is rare). They also have open ears so we provide feedback and suggestions that are sometimes incorporated into future models to continuously improve them for the changing business needs. The WireMac line of Akiles machines is especially great. There are 4 different WireMac models available, each with a different volume of user in mind, so they can really fit the bill for small office wire binding, medium, and large corporate solutions. So Rhin-O-Tuff machines are a bit different...they are multi-functional punching machines, meaning that they will punch the hole patterns for Wire-O as well as plastic coil bindings, comb, and more. All you do to switch between patterns is slide in a new punching die. They do not, however, come included with the binding unit which, for wire binding supplies, would be a wire closer. This is something you would get in addition to the punch, and either mount it onto the top, or use it as a stand-alone unit. Even though they are punch only, these machines are top-quality and made in the USA. They are sleek, professional, and can punch higher capacities than other machines, so there is less time spend punching stacks. They are high-value because of their durability, functionality, and their versatility, PLUS they have the longest warranty for a wire binding machine in the industry, which is 3-years long (most manufacturers offer between 90 days and 1 year only). The investment into these machines is higher than most Akiles machines, but the added functionality is a huge benefit for anyone that thinks they might expand their needs in the future. Since their machines and offices are all in the US, communicating and connecting with them is always simple, and they are incredibly thorough and fast to solve any issues that come up (also a very rare occurrence with their incredible manufacturing quality). There are 5 different Onyx models available, each with a different volume of user in mind, so they are appropriate for different size print shops and offices, all with a need to bind daily. James Burn is a step above the others, as they primarily manufacture binding machinery for high volumes, such as print shops and binderies. Their machines are automatic, and require very little labor to work, so you can produce the volume required for high output, without wearing out your operator with the manual punching task. These automatic wire binding machines are incredibly fast and efficient, so if your volume warrants them, they are an incredible value and can pay for themselves very quickly. We have a direct relationship with James Burn, with access to their specially trained service technicians and customer care, so we can get you connected to the right people for any need you may encounter. There are many automatic wire binding machines from James Burn, and we have featured 4 of the most popular ones below.